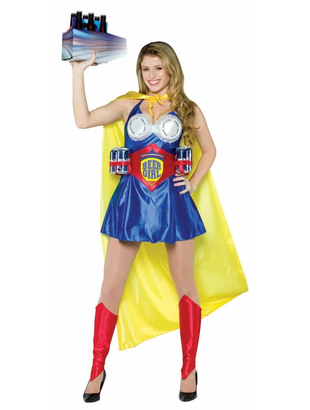 7 Piece superhero costume includes a blue halterneck dress with corset fastening at the back with red lace and bodice with shiny 'bottle caps' covering the chest with 'Twist Off' written on them..
Costume also includes a red belt with 'Beer Girl' printed writing and has a Velcro fastening with six slots for beer bottles or cans. For that true superhero look costume includes a long yellow cape ties around the neck. Finishing touches are a pair of red wrist cuffs with Velcro fastening and one pair of red spats that are worn around the shins, also Velcro fastening. 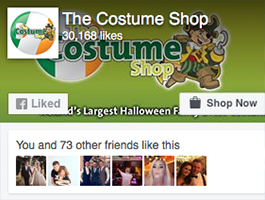 I wore this costume last year, it was so funny. decent fit but really short at the back, I wore blue shorts under it and it looked great!